Join Spring Street Gallery guest artist Mary Chatowsky Jameson as she leads us in a study on the seaweed that surrounds us. We will start the class by foraging for various seaweed specimens and then return to the gallery to press our findings into collaged works of art. Visit Mary’s website www.saltwaterstudio.biz to see examples of her work. Not only has she shown at the gallery but is also a regular at the various arts and crafts fairs on the island throughout the summer. Cost of this class is $45 and includes transportation to foraging and all materials. We need a minimum of 4 students to hold this course so please email heartspacebi@gmail.com to sign up or feel free to sign up through the contact information on our website! lessons and on site photography. 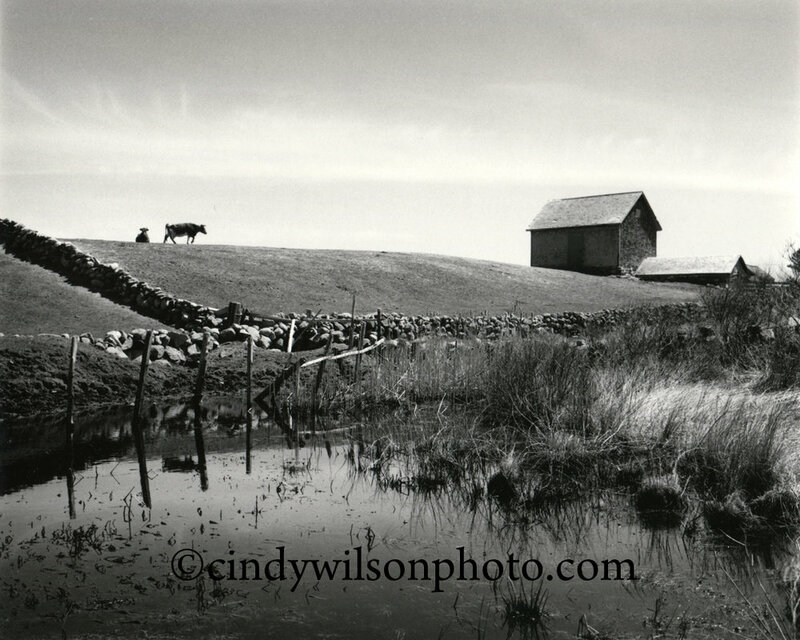 steps necessary to process a well crafted black and white image. Join gallery member Claire Marschak to create this tonal dune and seascape painting. We work with a limited palette and a variety of tools so it's a fun introduction to oil painting. Come join Gallery member John Warfel in this 4 part class. It will be 10/15, 10/16, 10/22 and 10/23 3PM-5PM each day (Please don’t let the start/end times above mislead you!) at John’s home studio. 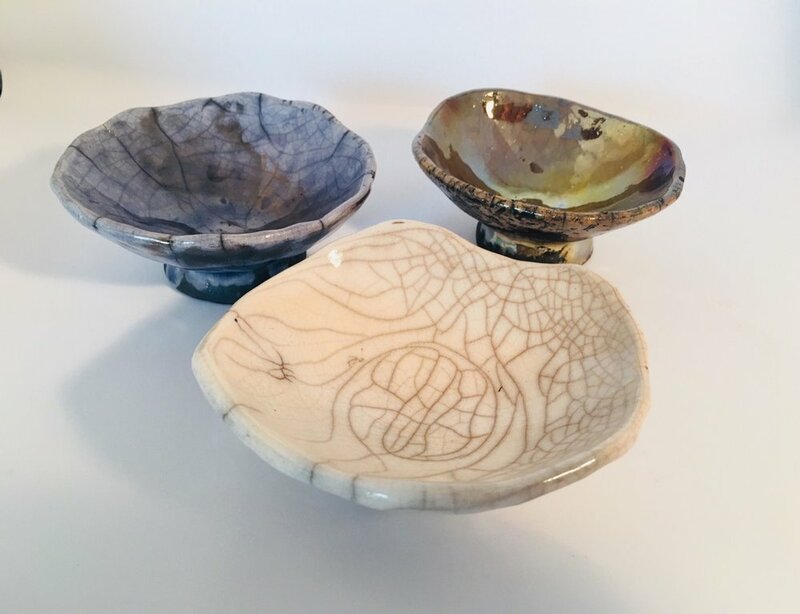 It is $30 per student (for all 4 days- not per day) and each student will have all of the materials provided to create their own hand-built ceramics and participate in pit-firing the pottery. While we are calling this an “all ages class”, be aware there is a very important fire element involved so be prepared. Also, please be ready to get a little dirty. Email springstreetgallerybi@gmail.com or contact Paige at heartspacebi@gmail.com to sign up! Indigo dying class taught by Liz (The Traveling Seamstress!) at the Spring Street Gallery. This course is $25 and includes all materials and tutorial on how to dye fabric with indigo and at the end you will leave with your own hand-dyed material! Email to sign up: heartspacebi@gmail.com or through our the Spring Street Gallery Website. Don't miss this great opportunity to photograph inside the hidden spaces of the Southeast Light! You will learn low light photography techniques practice long exposure photography while creatively interpreting interior spaces. Cindy Wilson will be your hands-on instructor to assist you in seeing and capturing unique images in this very historic and challenging environment. Bring your tripod! All levels of photographers are welcome. Cindy Wilson will lead this course, assisted by gallery coordinator Paige Gaffett. In these two-session classes, students will first learn about their cameras, their settings, exposure & composition in a classroom, then practice in a walkabout session. Class two will be in the classroom, where work will be shared & students will learn the process of downloading images, sizing and the basics of image enhancements. The Next Step class will focus on more advanced techniques such as composition, creative metering, focus modes and raw capture. Each class is limited to 8 students. Create your very own abstract expressionist painting. Michael Chapman will lead you through some techniques on visual form combined with layering color with texture. This exercise in painting will allow you freedom from conventional practices in visual art making. Come make your own beeswax kitchen wraps! Do away with plastic wrap and cellophane with these wax coated pieces of fabric- self adhesive and durable! Christine Griele of Littlefield Bee Farm will host this class and each student will leave with their own beeswax kitchen wrap(s) at the end of this one hour course. Lightweight cotton fabric will be available but if you have your own, please bring it! We will have the other supplies as well but if you have any old irons or cheese graters hanging around, feel free to bring your own! Email springstreetgallerybi@gmail.com for more info. **This is a drop in class but if you'd like to sign up, please text, call or email the Spring Street Gallery or Paige. Rosemary Connelli began creating art when she was a child, inspired by her island environment. 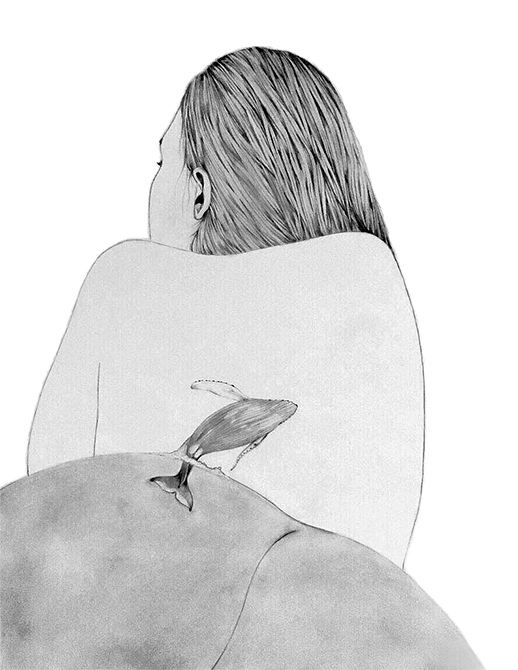 Growing up, she began to experience vivid dreams of whales approaching the island and would find herself in the dream helplessly rushing to the shore. “In dream interpretation, whales have been known to lead those back home when the time comes; in a sense, I am constantly being led back to the waters surrounding the island where I was raised”. While she always had a strong love for the ocean, she also struggled with loving her own body. “How can a woman learn to love herself and the body she carries, when the world forbids her to do so? I adored my island sanctuary, but continued to shame and hate my own body; the vessel I call home”. PLEASE JOIN US FOR THE RECEPTION TUESDAY AUGUST 28th from 5-7pm! Mary Newhouse (1935-2010) was born & raised in Fitchburg, MA, and attended Smith College, where she received a BA in Art in 1957, with advanced studies in printmaking with the renowned teacher and artist Leonard Baskin. Her love of the ocean began as a small child, when her family summered in Hampton Beach, New Hampshire. She grew up working summers in this small coastal town. She married Robert Newhouse, an ophthalmologist, and they lived in New York City, raising 3 daughters. Mary worked continuously on her own art, which included: oil and acrylic painting, photography, sculpture, wood and linoleum block printing, sewing, and hand-formed ceramics. Mary also worked as an elementary and high-school art teacher. In the 1970’s, Mary helped to found G.A.M.E (Growth through Art and Museum Experience) with Bette Korman. G.A.M.E. brought art programs to public schools throughout the city. At this time, NYC was in a fiscal crisis, and art programs were eliminated from many public schools. With funding from the National Endowment for the Arts, G.A.M.E eventually became the Children’s Museum of Manhattan. Its audience has grown to 325,000 visitors each year, which includes 30,000 children who visit as part of a school group and more than 34,000 children served through offsite outreach programs. Mary and Bob first visited Block Island in 1978, on the advice of friends. They immediately fell in love with the island, and began looking to purchase a property. With some trepidation, they ended up purchasing the Sea Breeze Cottages on Spring Street in 1979. The whole family worked hard fixing up the property’s cottages and planting the gardens. The Sea Breeze Gallery was first established on-site in 1980. It comprised two rooms in the building that is closest to Spring Street, with art openings happening in the front area by the hedges. The Sea Breeze Gallery soon became a showcase for a wide variety of artists working in many different mediums, and was the first of its kind on the island to show mixed-media exhibits. It was also the first to feature an annual exhibit of artists from RISD, including graduates and faculty members. Artists from RISD include: Eve Kaplan, Barry Gerson, Trina Bumiller, Jack Wax, Gary Niswonger, Willie Dexter, Hank Adams, Liz Pannell, James Watkins and the infamous Dale Chihuly. The Sea Breeze Gallery also showed the works of many other artists including: Margaretta Mitchell, Hank Adams, Tim Prentice, Christopher James, Renate Winston, Robert Ellsworth, Francesco Clemente, Robert Kushner, Mary Harty and Peter De Rosa, and jewelry by Thomas Mann. Block Island artists included: Ben Wohlberg, Gayle Goldsmith, Sean Hartnett, John Urbain, Josie Merck, Bill Padien, Jerry Powers, Sharon Lehman, Tom McAleer, Marilyn Bogdanfy, Stu Littlefield, and Cynthia Bloom. The establishment of The Sea Breeze Inn, a 10 room intimate bed and breakfast, followed soon after, and continues to thrive under the management of Andrea Moynier, the Newhouse’s youngest daughter. All of the guest rooms at The Sea Breeze contain original artwork culled from over 30 years of gallery exhibitions. Mary was inspired by the beauty of the natural world around her, and not only conveyed this through her painting, but also through her volunteer work on the island. Mary was one of the original founders of The Committee for the Great Salt Pond, and spearheaded the “no-dumping” movement to protect the clean waters of New Harbor from vessel sewage. New Harbor is a breeding ground for many species, including the horseshoe crab. Thanks to Mary’s hard work, New Harbor is now a federally recognized No Discharge Zone, which protects aquatic habitats and makes pumpout facilities for boaters available. Mary was also a co-founder of Scenic Block Island, another grass-roots environmental group that grew from a desire to protect the island’s beautiful open spaces, small-scale architecture, and keep over-development at bay. In the summer of 2009, Mary unexpectedly succumbed to a rare bacterial infection. After a 6 month battle in the hospital with an aggressive treatment, her family chose to remove her from life support in February of 2010. Mary’s selected exhibitions include: Chase Gallery, Baltimore; Exit Gallery, NYC; Alonzo Gallery, NYC; Bell Gallery, Greenwich, CT; Giraffics Gallery, Sag Harbor; Hatay Gallery, Northampton, MA; No. 6 Depot, Stockbridge, MA; Virginia Breier, San Francisco, Scott Pfaffman Gallery, NYC, Terrapin Chelsea Gallery, NYC, Grey Art Gallery, NYU, Encore Gallery, Block Island, Sea Breeze Gallery, Block Island; and The Island Gallery, Block Island. Collections include: Smith College, IBM Corporation, Delouitte and Touche, Chase Manhattan, and the Fitchburg Art Museum. Commissions include : Manhattan Lab Museum, NYC Dept of Cultural Affairs, NYC Youth Festival, NYC Public Library, and many private collections. Most recently, her work was shown at the Deja Vu Gallery on BIock Island, in 2013. Her family is delighted to be sharing her paintings and porcelain ceramics with her beloved island once again. Robin Bell is having a show at the Spring Street Gallery on August 25th. Her works are almost entirely digital images that combine ideas from painting, block printing and photography. This work is experimental and nearly all of it began by accident after she signed up for the wrong class at art school. It was a computer class for advertising and it taught how to make digital ads for things like the Bahamas and eyeglasses. It also gave Robin the opposite technical foundation that a traditional photographer would look for. 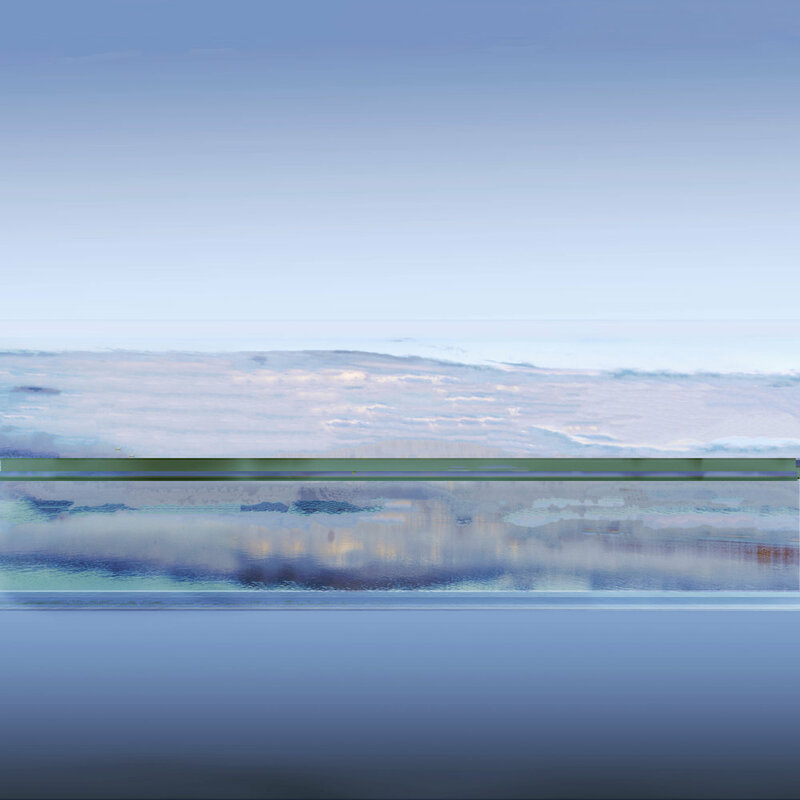 Instead, it pushed her on to invent digital methods to create abstract composites of real images that come out of Block Island. Everything became a conversation between understandable and iconic scenes and their isolated and pure idea. It all came from a wonderful enrollment mistake. Every photo is from somewhere on Corn Neck Road on Block Island, within hiking distance from Robin’s home. This pretty much limits her to a field, a dock, a pond, and one old house. But there is lots of color, especially blue—blue is everywhere on an island. And there is lots of weather, so every day a different shape or color stands out, which is a take off point for more art. Robin lives part time on Block Island and New York City. She has studied at the School of Visual Arts and the International Center of Photography, both in New York, and the New England School of Photography in Boston. They have all been great. The Spring Street Gallery is pleased to present paintings by Berke Marye. The show runs from Tuesday, August 21, – Monday, August 27, 2017. An opening reception will be held on Tuesday, August 21 from 5 – 7pm. 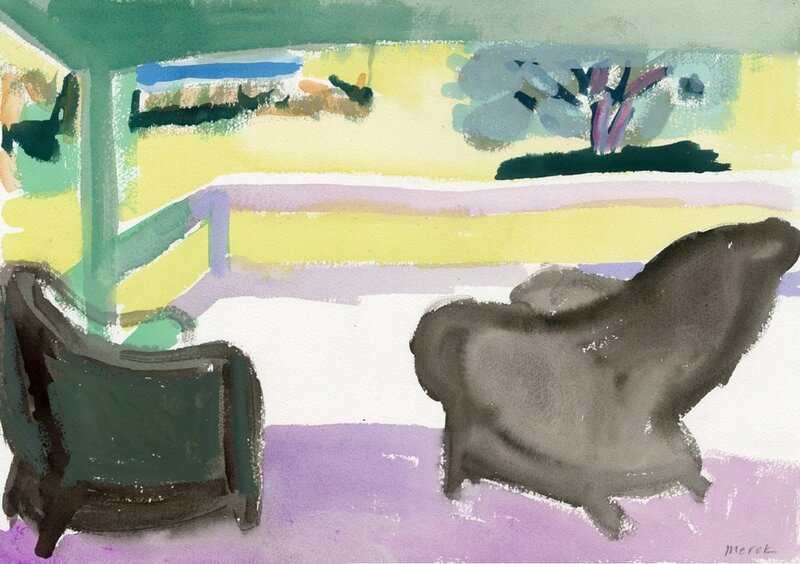 This new body of work is a departure from Marye’s earlier style of bold colors and composition. His pallet suggests a more ethereal energy that combines texture and subtle depths. Working out of a small studio mainly during the winter months Marye’s work reveals a nod to the chill and crispness of the shorter, colder days. What results are pieces that possess movement and fluidity. To challenge himself Marye likes to vary the shape and sizes of his canvas, which forces him to adjust his style and attitude towards each piece. Gallery hours are 11 - 6 pm daily. Have you ever had a party with the moon? Spring Street Gallery is featuring new work from photographer Robin B. Langsdorf and ceramic artist Karen Capuciati – together in a show titled, Having a Party with the Moon. The show runs August 14 through August 24. The public is invited to join the opening reception on Saturday, August 18 from 5-7 pm. Working separately over the winter, the moon became a focus of each artist as they developed art for this upcoming show. “Earlier this season Robin sent me the images she had selected. I was struck by their sheer beauty, but also was amazed at the coincidence of the moon showing up in her work, as it did in mine” reflected Karen. Karen created and fired her pottery at Dunn Town Studio here on Block Island. The work is mostly raku-fired which is a firing technique adopted from Japan that uses an outdoor kiln from which pieces are pulled at molten-hot temperatures and placed into wood shavings which then combust into fire. This dramatic process can create crackled glaze that is accentuated by the carbon that gets trapped in the reduction process. Robin and Karen are both members of the Spring Street Gallery — a non-profit artist cooperative. The gallery is open daily from 11am to 6pm. Come get your copy of Colors of Block Island signed by Spring Street Gallery member Claire Marschak! Josie Merck will be showing her paintings as a guest at the Spring Street Gallery between Tuesday, August 14th and Monday, the 20th. The work spans years of paintings trees in their various settings on Block Island. Some are portraits of trees long gone--- taken out by storms or old age. Some are portraits of familiar individuals—apple, shad, elm, or maple. The work is in a variety of materials--- watercolors, oils, and mixed media. Josie has shown her work on the island over the years primarily at Mary Newhouse’s Encore Gallery once in “The Tiffany Building” (now Lazy Fish) and later in the New Post Office Building. Encore embraced a vibrant cadre of artists some of whom now have new venues on island: Ben Wohlberg, Sean Hartnett, Bill Padien. Those no longer with us, whose work lives on, include Cynthia Bloom, Bakeland Roll, Mary Newhouse, and Tom Macaleer. Josie’s most recent show on Block Island was at Ned Phillips’ Aurora Gallery, “Natives, Invasives & Exotics”, which explored the wild flora and fauna of our natural island community. The opening of the show will be on Tuesday 14 August from 5-7pm and will remain up for the week until Monday August 20st from 10-6 daily. Mary Chatowsky Jameson is the owner of Saltwater Studio in Newport, Rhode Island. She is an artist who explores the marine environment for inspiration in her artwork. 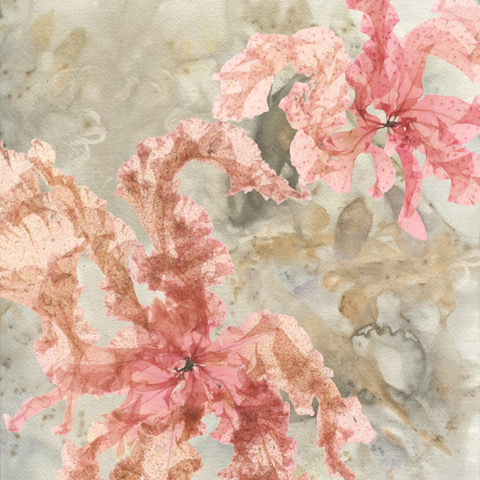 Her Marine Botanical pressings and collages are created from seaweed and organic elements collected on excursions throughout the northern Atlantic coast. Ebb and flow is the rhythmic change of the ocean tides. A change that is responsible for producing the exquisite beauty of a cresting wave glistening with sunlight and the endless deposit of treasures along our shores. Local Islander Thea Monje will have her photographs on display as our guest artist this week! Opening Reception Tuesday July 17th from 5-7.